Read David Maldow's account of why Virtual Meeting Rooms (VMRs) are rapidly becoming the default means of connecting via video, whether it be for one-on-one or group meetings. We always knew that videoconferencing was an inevitability. As kids, when watching TV shows such as the Jetsons, some of the “future technology” seemed a little far-fetched and ridiculous. However, the ubiquitous videoconferencing was a no-brainer. In fact, I strongly believe that in the near future we will find the idea of audio-only conversations to be strange and archaic. With much of conversational information being conveyed through non-verbal means (facial expressions, gestures, etc.) video is the obvious choice for remote communications. While the eventual adoption of video has always been obvious; the means of how we would do so has been a bit of a mystery. For example, there has never been anything close to a consensus on how we would even connect our video calls. The Jetsons simply punted on the question. 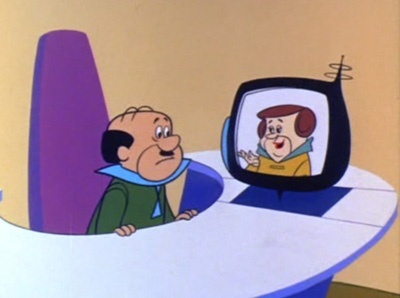 You never saw George dial a call, he would just walk up to a screen and Mr. Spacely would appear and start yelling at him. Without any guidance from our science fiction world, we have been forced to figure out the video dialing dynamic ourselves through years of trial and effort. If you asked me 30 years ago how videoconferencing would work in 2015, I would have assumed it would simply be an extension of our existing telephone dynamic. We would bolt little screens onto our existing desktop phones, and all phone calls would turn into video calls. I wasn't the only one picturing the desktop videophone as the future of communications, but this was clearly wrong. We didn't foresee the fact that the existing phone line network would be incapable of supporting video traffic and that most desktops would have a large computer screen which would be far better suited to hosting our video calls. We were wrong about desktop videophones being the future of communications (although they are popular in certain applications). Desktop video is, and will be, primarily hosted on our laptops and desktop PCs. Relying on the old school phone dialing dynamic to connect calls is not an option. This left us in the wilderness, having to create a new call connection dynamic out of whole cloth. When video over the internet was new (about 10-15 years ago), each video device was assigned an IP address, much like any PC connected to the internet or any website for that matter. One video system could call another by dialing their IP address. This was less than ideal for a number of reasons. We have a hard enough time remembering 7 digit phone numbers these days; asking us to dial using an 11 digit IP address is not a winning solution. Fast forward 15 years and we have settled on two basic options for connecting calls - directory dialing and VMRs (Virtual Meeting Rooms). Theoretically, directory dialing would be used for person-to-person calls. Just as you use your contact list to dial by name on your phone, we use directory lists to dial by name on our video solutions. Unfortunately, this only works if everyone you want to call is in your directory. This leaves us with VMRs. Originally, VMRs were intended for group video calls. The connection dynamic mimics the old familiar “meet me” phone conference calls. Rather than calling a person, everyone dials into an imaginary room in the sky. This has always worked well in the audio world, because it fairly mimics an in-person meeting. Someone reserves a room, everyone gets directions on how to get to the room, and everyone shows up at the designated time. Generally, with virtualized technology solutions, mimicking the non-virtual or in-person workflow is a good idea so that people have a more natural experience and less adoption pains. While it wasn't a big surprise that VMRs were readily accepted by new video callers, due to the familiar “meet me” dynamic, it was somewhat unexpected that joining a VMR is actually easier than a standard audio conference call. Consider the steps required for both situations. To join an audio “meet me” room you need to find the number in your email invite, dial it on your phone (followed by the pound), then dial the password, then say your name, then awkwardly interrupt those who are already in the meeting to let them you know you have joined. In comparison, to join a VMR you simply click a link in your email and get your smile ready for when the app (or browser) opens up and puts you in the meeting. In fact, joining VMRs is so easy, that it has become the preferred meeting dynamic even for many person-to-person calls! This is particularly true for calls with externals. Your organization may have a solid directory based system, allowing for direct dialing to others listed in the directory. However, this doesn't work so well for calling externals (clients, partners, etc.). You could go through the trouble of having your IT department add the external to your directory before the call, or you can simply send that person an email with a link to your “meet me” room. As a result, we have found ourselves using VMRs as the default means of connecting via video. It is the obvious choice for group meetings, and the easiest way to invite guest (or external) callers. Bottom line, today's videoconferencing generally uses a “your VMR or mine” meeting setup and it’s working very well for us. Click here to learn more about Videxio’s VMR offering.